Do you need an crowd pleasing cookie recipe this holiday season? 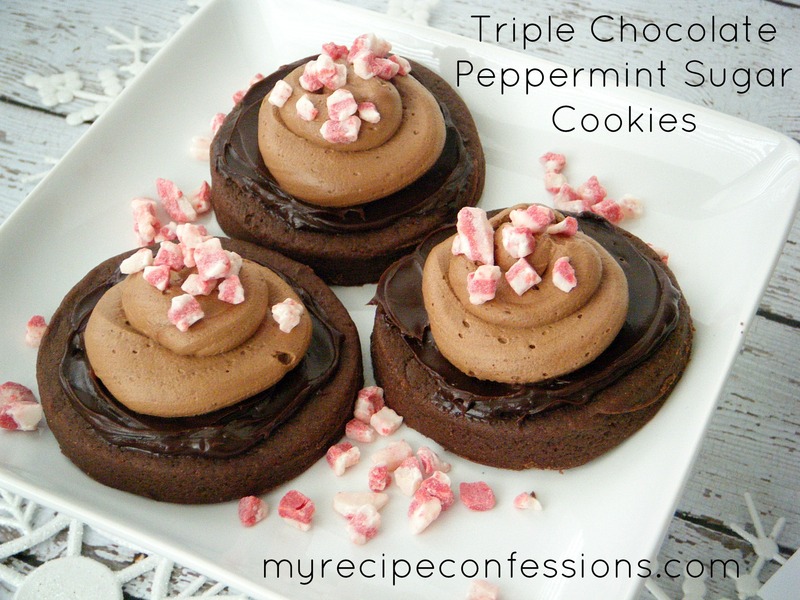 Nothing screams Christmas like the heavenly combination of peppermint and chocolate. 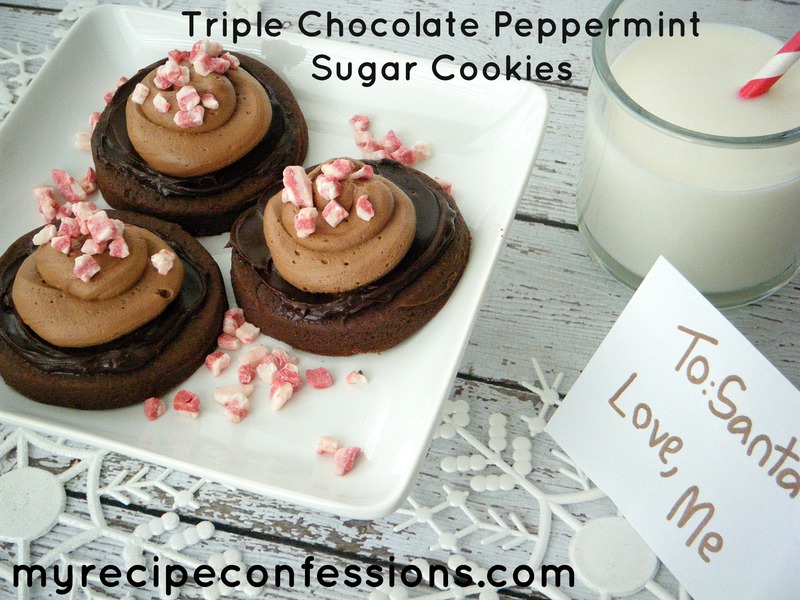 This recipe starts out with a super soft chocolate sugar cookie. Then you spread some silky smooth peppermint chocolate guanche. Next you pipe on some velvety chocolate mouse and you top it off with a sprinkling of crushed peppermint. These cookies will not disappoint! The only problem with these cookies is that they tend to bring out the selfish side in people because once you taste these babies, you will want to eat them all yourself! Here are a few tips for making the cookies. 1. The dough will be soft. If it is so soft that you can’t roll it out, wrap it up and place it in the refrigerator for 30 minutes. Do not add more flour or the cookie will be too dry. 2. You have to use semi sweet chocolate chips when you make the peppermint gaunche and the mousse. Milk chocolate chips are too mild and it will not have as good of a flavor. 3. You need to use peppermint extract not mint extract. Trust me the mint extract is not nearly as good as the peppermint extract. 4. Use a good quality chocolate chip. If not, your chocolate mousse will be grainy. 5. When you are making the chocolate mousse, make sure your guanche is cold. If not the mousse will not whip up to a stiff peak. 6. You have to use heavy cream when making the chocolate mousse. It is not nearly as thick and creamy with regular whipping cream. 7. Do not over bake the cookies. Remember the cookies will continue to cook for a little bit after you pull them out of the oven. * Update: I found that if I add 1/2 cup of melted milk chocolate chips to the cookie batter, the cookies have a more pronounced chocolate flavor. I also changed the flour from 3 cups to 3 1/2 cups. Once I have mixed all the ingredients together, I place the cookie dough into the refrigerator for 30 minutes so the dough is easier to handle. 1. Whisk dry flour, salt, and baking powder in bowl and set aside. Cream the butter, sugar, and eggs together. Add cocoa, sour cream, melted chocolate chips and vanilla extract. Mix until smooth. 2. Gradually add flour mixture and mix until smooth. Wrap in plastic wrap and chill for 30 minutes. 3. Roll out cookie dough so that it is ¼ inch thick. Cut into desired shapes. Place cookies on a greased cookie sheet and bake for for 8 to 9 minutes. Transfer to a wire rack and cool completely. 4. Spread the chocolate ganache onto the sugar cookie. With a pastry bag or zip lock bag, pipe the mousse in the center of the cookie. Sprinkle the crushed peppermints over the top of the mousse. Chill in the fridge until you are ready to serve. Store any leftover cookies in the fridge. 1. Place the chocolate chips in a medium size heat proof bowl. Bring the heavy cream to a simmer in a small sauce pan. Pour the hot cream over the chocolate chips. 2. Add the peppermint extract and then mix until it is a smooth chocolate consistency. Place in the fridge for 30 minutes or until it is completely chilled. 1. Place the semi-sweet chocolate chips in a large heat proof bowl. Bring one cup of heavy whipping cream to a simmer in a small sauce pan. Pour the hot heavy cream over the chocolate chips. Let it sit for about 3 minutes and then mix until it is smooth. 2. Place the ganache in the fridge until completely chilled, about 1 hour. Once the ganache is completely chilled, add two cups of heavy whipping cream to the ganache. With a mixer, whip the cream and ganache together until stiff peaks form. Thank you for including me in your recipe round up! Thanks for adding me to your round up! Thanks for including me in your recipe round up! Thank you so much for including me in your recipe round up!